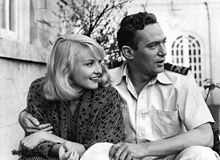 Frederick George Peter Ingle Finch (28 September 1916 14 January 1977) was an English-born Australian actor. He is best remembered for his role as “crazed” television anchorman Howard Beale in the film Network, which earned him a posthumous Academy Award for Best Actor, his fifth Best Actor award from the British Academy of Film and Television Arts, and a Best Actor award from the Golden Globes. He was the first of two persons to win a posthumous Academy Award in an acting category, and coincidentally also the first of the two Australian actors to have done so, the other being Heath Ledger. George Finch was born in New South Wales, Australia, but was educated in Paris and Zrich. He was a research chemist when he moved to Britain in 1912 and later served during the First World War with the Royal Army Ordnance Depot and the Royal Field Artillery. In 1915, at Portsmouth, Hampshire, George married Alicia Fisher, the daughter of a Kent barrister. However, George Finch was not Peter Finch’s biological father. He learned only in his mid-40s that his biological father was Wentworth Edward Dallas “Jock” Campbell, an Indian Army officer, whose adultery with Finch’s mother was the cause of George and Alicia’s divorce, when Peter was two years old. Alicia Finch married Jock Campbell in 1922. In 193435 he appeared in a number of productions for Doris Fitton at the Savoy Theatre, some with a young Sumner Locke Elliott. He also worked as a sideshow spruiker at the Sydney Royal Easter Show, in vaudeville with Joe Cody and as a foil to American comedian Bert le Blanc. At age 19 Finch toured Australia with George Sorlie‘s travelling troupe. He did radio acting work with Hugh Denison‘s BSA Players (for Broadcasting Service Association, later to become Macquarie Players). He came to the attention of Australian Broadcasting Commission radio drama producer Lawrence H. Cecil, who was to act as his coach and mentor throughout 1939 and 1940. He was “Chris” in the Children’s Session and the first Muddle-Headed Wombat. Finch’s first screen performance was in the short film The Magic Shoes (1935), an adaptation of the Cinderella fairy tale, where Finch played Prince Charming. After the war, Finch continued to work extensively in radio and established himself as Australia’s leading actor in that medium, winning Macquarie Awards for best actor in 1946 and 1947. He also worked as a compere, producer and writer. In 1946, Finch co-founded the Mercury Theatre Company, which put on a number of productions in Sydney over the next few years (initially in the diminutive St James’ Hall), as well as running a theatre school. Laurence Olivier and Vivien Leigh toured Australia in 1948 with the Old Vic Company. They attended Mercury production of The Imaginary Invalid on the factory floor of O’Brien’s Glass Factory starring Finch. Olivier was impressed with Finch’s acting and encouraged him to move to London, his birthplace. He left Australia for good in 1948. When Finch arrived in Britain, Olivier became his mentor and put him under long-term contract. His first big break was being cast in James Bridie‘s play Daphne Laureola at the Old Vic supporting Edith Evans. This was a significant critical and commercial success and established Finch in London immediately. During this time, Finch continued to appear on stage in various productions while under contract to Olivier. Finch’s closeness to the Olivier family led to an affair with Olivier’s beautiful but increasingly unstable wife, Vivien Leigh, which began in 1948, and continued on and off for several years, ultimately falling apart due to her deteriorating mental condition. Despite his stage experience, Finch, like his mentor Olivier, suffered from stage fright, and as the 1950s progressed he worked increasingly in film. Finch’s film roles increased in size and prestige through the early 1950s. For Walt Disney he played the Sheriff of Nottingham in The Story of Robin Hood and His Merrie Men (1952). He was given two good roles in films from Alexander Korda: as Richard D’Oyly Carte in The Story of Gilbert and Sullivan (1953), and as a priest in The Heart of the Matter (1953), from the Graham Greene novel. In 1953 he appeared in his first Hollywood movie, Elephant Walk (1954), shot in Sri Lanka and Los Angeles. The circumstances of production were turbulent; filming started with Vivien Leigh in the lead but she had a nervous breakdown during production and had to be replaced by Elizabeth Taylor. The experience helped sour Finch on a Hollywood career and he would only work occasionally there for the rest of his career. Towards the end of 1954 Finch’s contract with Laurence Olivier was about to expire and he instead signed a seven-year contract with the Rank Organisation worth 87,500 to make one film a year for them. “We are going to build Peter into a major British star”, said Earl St. John, Rank’s head of production, at the time. Finch’s first roles for Rank under the new arrangement gave him star parts but were, on the whole, undistinguished: Make Me an Offer (1954), Simon and Laura (also 1954), Josephine and Men (1955), and Passage Home (also 1955). His next two films for Rank were not particularly successful: Windom’s Way (1957), where he played a doctor caught up in the Malayan Emergency, and Operation Amsterdam (1959), a war time diamond thriller. Finch’s career received a boost when Fred Zinnemann cast him opposite Audrey Hepburn in The Nun’s Story (1959). This was an enormous financial and critical success and established Finch’s reputation internationally. Finch made a series of unsuccessful Hollywood films: The Sins of Rachel Cade (1961), an attempt to repeat the success of The Nun’s Story, with Angie Dickinson; then two for director Robert Stevens at MGM: I Thank a Fool (1962) and In the Cool of the Day (1963). Finch’s next three films saw him support notable female stars: Sophia Loren in Judith (1966), Melina Mercouri in 10:30 P.M. Summer (1966) and Julie Christie in Far from the Madding Crowd (1967). He was reunited with Aldrich for The Legend of Lylah Clare (1968). The Red Tent (1970) was an expensive international adventure film, with Finch as Umberto Nobile. Finch’s career received another boost when Ian Bannen dropped out of the lead in Sunday Bloody Sunday (1971). Finch replaced him and his performance was rewarded with another BAFTA for Best Actor and an Oscar Nomination. Shortly after Raid on Entebbe finished shooting, Finch undertook a promotional tour for Network. On 13 January 1977 he appeared on The Tonight Show Starring Johnny Carson. The day after, he suffered a heart attack in the lobby of the Beverly Hills Hotel and died at the age of 60. He is interred in the Hollywood Forever Cemetery. Finch was nominated for an Oscar for Network and went on to posthumously win the award, which was accepted by his widow, Eletha Finch. Although James Dean, Spencer Tracy and Massimo Troisi were also posthumously nominated for a Best Actor Oscar, Peter Finch was the first actor to have won the award posthumously, as well as the first Australian actor to win a Best Actor award. He was the only posthumous winner of an Oscar in an acting category until Heath Ledger won the Academy Award for Best Supporting Actor in 2009 (there were many earlier posthumous Oscar winners in non-acting categories; Ledger was also an Australian). Finch also won five Best Actor awards from the British Academy of Film and Television Arts (BAFTA), including one for Network. We all say we’re going to quit occasionally… I’d like to have been more adventurous in my career. But it’s a fascinating and not ignoble profession. No one lives more lives than the actor. Movie making is like geometry and I hated maths. But this kind of jigsaw I relish. When I played Lord Nelson I worked the poop deck in his uniform. I got extraordinary shivers. Sometimes I felt like I was staring at my own coffin. I touched that character. There lies the madness. You can’t fake it. Finch was married three times. In 1943, he married Romanian-born French ballerina Tamara Tchinarova; they worked together on a number of films. They had a daughter, Anita, born in 1950. They divorced in 1959, after she discovered his affair with actress Vivien Leigh in California. He then married South African-born actress Yolande Turner (ne Yolande Eileen Turnbull); they had two children together, Samantha and Charles Peter. During their marriage, Finch had an affair with the singer Shirley Bassey. Bassey had a daughter, also called Samantha, born in 1963; Bassey’s husband at the time, the openly gay film producer Kenneth Hume, believed that Finch was her biological father. Finch and Turner divorced in 1965. In 1972 Finch married Mavis “Eletha” Barrett, who was known as Eletha Finch. They had a daughter together, Diana. In 1954, the Australian journalist and author George Johnston wrote a well-researched series of biographical articles on Finch, his life, and his work, which appeared in the Sydney Sun-Herald on four consecutive Sundays, which were certainly the first detailed account of Finch’s life to be published. Finch later provided the inspiration for the character Archie Calverton in Johnston’s novel, Clean Straw for Nothing. 1935 The Magic Shoes Prince Charming A short film, now considered lost, although some stills exist at Australia’s National Film and Sound Archive. First Men in the Moon Bailiff’s man Finch plays an uncredited cameo in this film. He was visiting the set when the actor who was supposed to play the part failed to show up. False Colours by Frank Harvey Independent Theatre, Sydney, 1935. Under the Big Top touring show with George Sorlie, various Queensland towns, 1936, playing Herbert Hughes in Laughter of Fools by H.F. Maltby, Smithers in Married by Proxy by Avery Hopwood, Peter in Fair and Warmer by Avery Hopwood, Hunter in Ten Minute Alibi by William Armstrong all directed by William McGowan with Murray Matheson, Rosalind Kennerdale, Leslie Crane, Eva Moss, Norman French, Julia Adair and George Douglas. The Seagull by Anton Chekhov translated by Ann Jellicoe, as Trigorin Queen’s Theatre, London, 1964 directed by Tony Richardson with Peggy Ashcroft, Peter McEnery, Vanessa Redgrave, Paul Rogers and George Devine.